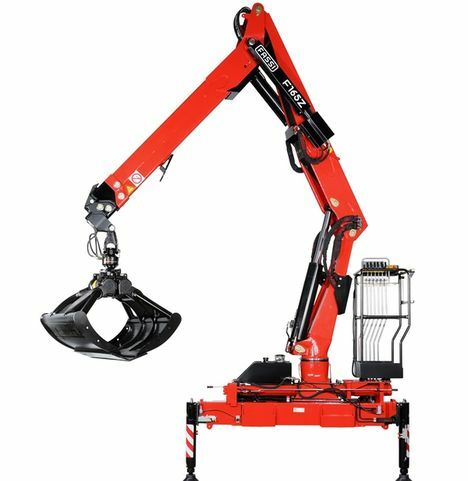 Fassi will launch a new 15 tonne/metre loader crane next week at the Solutrans exhibition in Lyon. The F165AZ has been developed with a eye on the French public works market, and features a built in foldable control station and unusual over centre geometry, both intended to take up less space and free up the truck bed from obstructions, especially handy when used for loading/unloading loose material with a clamshell grab. The three section boom has two telescopic sections which use a single cylinder and extension chain saving space which allows hoses to be routed internally. Maximum reach is eight metres. The prototype at the show will be in the Basic configuration with direct hydraulic controls. A version is also planned with Danfoss compensated proportional valve bank and radio remote controls with GAS (Grab Automatic Shake) device, which uses software control of the bucket movements while unloading materials.